People keep telling me to cherish my time with the baby - she'll only be small for a short time. And I know they're right - for the past six and a half months the time has been flying, but in an orderly, gradual, progressive kind of way. But I've been working for three days. I mean, just about non-stop, from rehearsal to lesson to concert to board meeting to bed, and Zoe's been at home with Steve. And suddenly my baby is hardly even a baby any more. She has two teeth and some hair. She can crawl - fluently, fast, and purposefully. She can say Emm, Emm, when she sees me, and can make signs for Milk and More. She can sit straight up like a teddy bear, and can get herself into that position easily. I had seen these skills before, but she's better at them now. 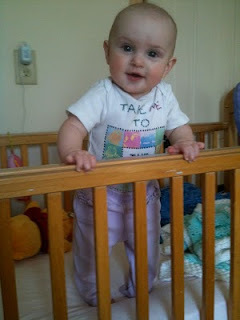 And NOW she can suddenly pull herself up to stand. And use our furniture as a basis for gymnastics instead of just a barrier to crawl around. And take things out of bookshelves, boxes, and bags and play with them. I'm a little bit in shock. Slow down, Peanut - I was just beginning to get used to the idea of a mobile, smart baby, but I'm not ready for a walking baby. That's too much baby for me. That's really not a baby at all. That's a child. Aren't there other skills you could work on first? Like sleeping through the night? Or the O-M-M-Y part of my name? Thanks for your comment, and thanks for reading, Jen! Whew - I am glad that outlet was taken care of.